In 1975, the Church Committeemen were concerned about the appearance of the church. Rain caused the windows to leak and water to come in under the platform of the sanctuary, allowing puddles to form in the Communion line. When Bishop Ackerman came for Confirmation in March 1976, the Committeemen met with him to discuss the possibility of completely renovating the church. The Bishop was in total agreement with the need. Father Wagner wrote for permission to do the work. Permission was granted. The work was completed inside and out by 1979. Father Wagner was scheduled to leave July 1, 1979, but asked to stay until the work was completed. In November of 1979, Father John Seiler was appointed Pastor. After a year, Fr. Seiler resigned to become chaplin to the sick at St. Luke Hospital in Ft. Thomas, where his compassion toward the sick has been greatly appreciated. Father John Resinberg was appointed Administrator until Father David Shockey was appointed Pastor on July 1, 1981. Father Shockey was a good match to our parish. He was a strong leader. He listened and explained why he agreed or did not agree with someone. Father Shockey strongly believed in Catholic education. When our school enrollment dropped to 39 students, he led the fight against closing the school. Again, the diocese let the school remain open. 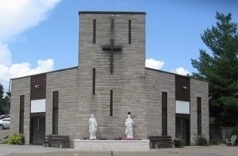 In 1988, the parish debt from the renovation of the church was retired. The school was instructing 74 students in 3 classrooms with 3 teachers. It was decided to build on a 2-room addition and hire a fourth teacher. When Father Shockey's 10 years of service were completed, the church and school were in sound order. In July 1991, Father Joseph Boschert became our new pastor. Due to the opening of the AA Highway, and the fact that the sons and daughters were remaining faithful to their roots and were building on the family land, the parish doubled in size. The school enrollment, therefore, also increased. Father Boschert led the parish through an extensive building program. Four classrooms were added, 4 more teachers were hired, and a large social center with ample parking was built. Volunteer work and a successful pledge drive returned the parish debt-free. In 2001, it was predicted that in the year 2004-5, the first grade enrollment would be over forty. The options were discussed and it was decided to build 4 more classrooms. A kindergarten was started in 2003. On July 1, 2005, Father David B. Gamm became our new pastor.